Established in 2005, the Sacramento Valley Professional Chapter of Engineers Without Borders has evolved from a fledgling professional chapter into a large, diverse, and dedicated group of engineers and professionals motivated to help those in the least developed communities. Over the past year, EWB has sent two teams of volunteer professionals abroad, one to Belize and one to Panama. Next year EWB hopes to send teams back to Belize and Panama, and also to our ongoing project in Kenya. 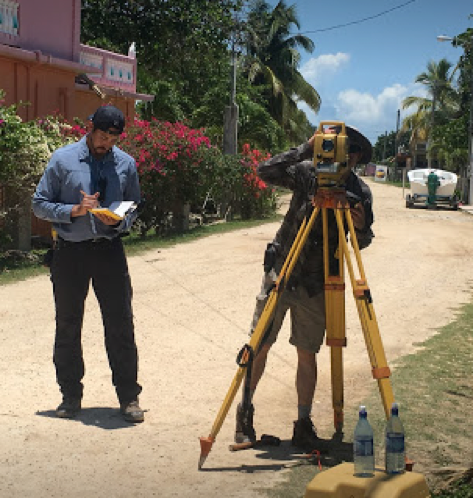 EWB sent a team of seven volunteers on an assessment trip to Sarteneja, Belize from May 12 to May 21. The village experiences frequent flooding that has become more severe in recent years. During the assessment trip, the team braved heat, humidity, and voracious mosquitoes as they performed a topographical survey of the village’s road network; mapped overhead utilities; obtained maps of underground utilities; interviewed several non-profits about the flooding problem; installed gauges to measure water levels in wells, ditches, and in the ocean; and priced materials, tools and equipment. The team was surprised to learn the flooding is not caused by storm surge or overflowing streams. Instead, the flooding is caused by a combination of factors including nearly flat topography, relatively impervious soil, limited and poorly maintained drainage systems, and roads that are higher than the surrounding building foundations and effectively act as levees. The Village Council was very helpful in establishing contacts, setting up interviews, and providing food and lodging during the trip. The team has completed its post-assessment report and received approval from EWB’s national office to move to the alternatives analysis phase. After completing the alternatives analysis and design phases and receiving approval from EWB’s national office, the team plans to return to Sarteneja in April 2018, when the men of the village are home from their seasonal fishing trips, to implement the preferred alternative. This will likely include coordination with the national government’s Ministry of Works, who will supply equipment and operators for free as long as the village pays for the operators’ food. The implemented solution will improve quality of life within the village by greatly reducing flooding and consequential property damage. EWB sent a team of four volunteers on an implementation and assessment trip to Tranquilla Norte, Panama from May 27 to June 9. The team installed a pump and piping to connect an existing water supply well to an existing elevated storage tank. 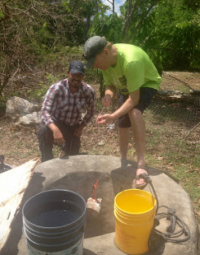 The team then connected the storage tank to water supply distribution system. The team hoped that this additional supply would help meet the water demands for the downstream portion of the community. The tank and well are located near a portion of the community that does not receive water from the pipeline. While in Panama, the team also assessed the state of river crossings and the site of the main water storage tank. The team members met with the Community to prioritize projects. EWB learned that the main storage tank site was the most pressing need. Last year, two landslides around the main storage tank threatened the surrounding hillside and led to community members deciding to reroute pipes around the tank. 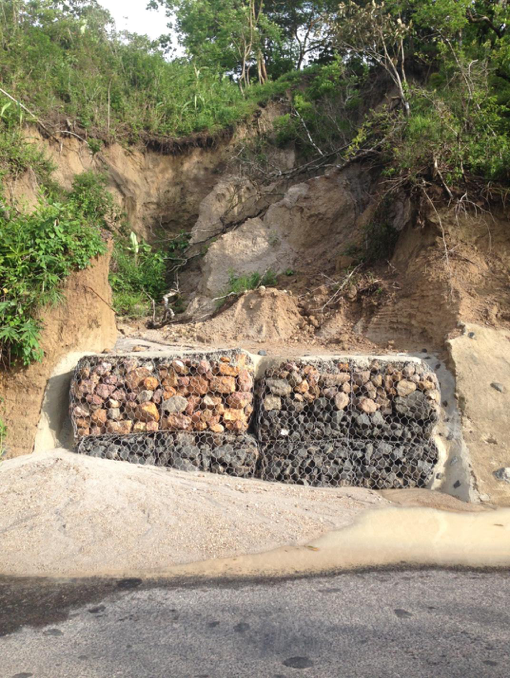 The team assessed the damage and gathered information to develop a plan to stabilize the hillside near the tank. The team plans to return to Tranquilla Norte, Panama in Spring 2018 to stabilize the hillside. Although the River Crossings were identified as no longer being a high priority, some assessment was still performed. Assessments included collecting Global Positioning System (GPS) points at each river crossing to geographically locate the crossings. Crossing depth and width were also measured. In 2015, EWB sent two teams to East Kanyamamba, Kenya to construct three spring boxes, two tanks, and a pipeline distribution network. The team plans to return to the community in 2018 to monitor the constructed system and construct an additional spring box. This past year the team has worked to develop a continued implementation plan to address the community’s long-term infrastructure needs.